If you’ve come from ASP.NET 4.5 you would have been familiar with the bundling/minification API and other bundling options like ClientDependency, but that is no longer available in ASP.NET Core, instead it is advised to do all the bundling and pre-processing that you need as part of your build process …which certainly makes sense! So why create this library? A few reasons: some people just want to have a very simple bundling library and don’t want to worry about Gulp or Grunt or WebPack, in a lot of cases the overhead of runtime processing is not going to make any difference, and lastly, if you have created something like a CMS that dynamically loads in assets from 3rd party packages or plugins, you need a runtime bundler since these things don’t exist at build time. It’s easy to get started with Smidge and there’s lots of docs available on GitHub that cover installation, configuration, creating bundles and rendering them. Previous to version 2.0, you could only configure aspects of the Production options and the Debug assets that were returned were just the raw static files. With 2.0, you have full control over how your assets are processed in both Debug and Production configurations. For example, if you wanted you could have your assets combined but not minified in Debug mode. This will also allow for non native web assets such as TypeScript to have pre-processors running and able to work in Debug mode. I’ve enabled support for a Nuglify pre-processor for both CSS and JS (Nuglify is a fork of the Microsoft Ajax Minifier for ASP.NET Core + additional features). 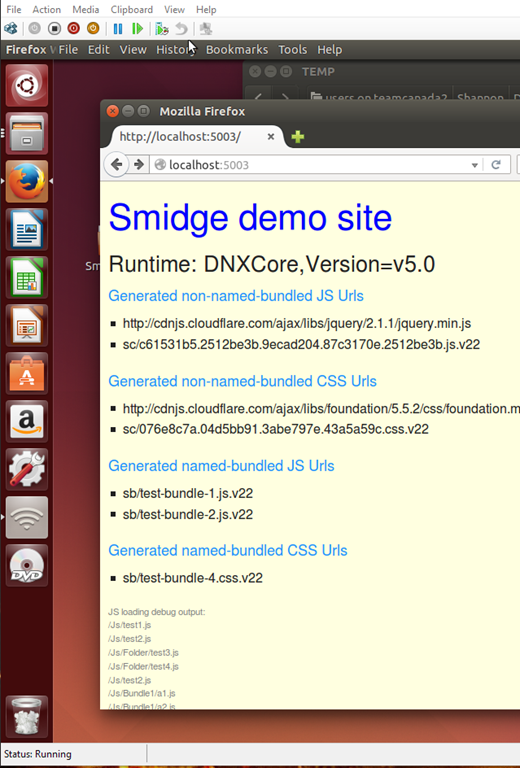 I also enabled support for an Uglify NodeJs pre-processor which uses Microsoft.AspNetCore.NodeServices to invoke Node.js from ASP.NET and run the JS version of Uglify. I just need to get these on Nuget but haven’t got around to that yet. Now the question is, "is h1 a better tagname for the artist of the album than artist?". I'm pretty sure the answer is no. However, the HTML engine has no idea how to display an artist tag - it treats every unknown tag like a span tag. So display information has to come from somewhere else. Some people may find the idea of markup depending entirely on CSS for display abhorrent. I do not. I maintain that reading the source of the album XML block makes just as much sense as reading the rendered HTML version. And screenreaders...if I was a screenreader I'd want concise and descriptive XML, rather than having to wade through a bunch of HTML crap. And let's be real: everyone's web client supports CSS. Styling XML with CSS is actually very simple and very robust. The first thing to understand is that HTML is just a custom namespace of XML. The second thing to understand is you can have multiple namespaces present in any XML document. That means you can use both HTML and, say, a custom namespace...which you can define and set styling rules. I won't blather much more. I'll just fill you in on how CSS targets namespaces. Here I declare that the XML inside and including the albums block is of the namespace http://jdiacono.org/music. Don't be misled by the namespace looking like a URL...I haven't even registered jdiacono.org and this is still valid. This is because namespaces are actually just unique, case-sensitive strings, and URLs tend to be unique and full of information. Let it be known that this block is all there is. It is a completely self descriptive block of pure data, which references nothing external. Now I have another example that is much more nourishing, which uses HTML and a custom XML namespace in the same page. You will need a browser other than IE to view this. UPDATE: Looks like IE9 is supporting this! This is the first installment of what will hopefully be many Umbraco benchmark reports created by various members of the core team in the lead up to the launch of Umbraco 4.1. This benchmark report is about the request/response performance of the Umbraco back-office. This compares 4 different configurations: 4.0.3 with browser cache disabled (first run), 4.0.3 with browser cached files, 4.1 with browser cache disabled and 4.1 with browser cached files. These comparisons have been done by using newly installed Umbraco instances with ONLY the CWS package installed. The benchmark results were prepared by using Charles Proxy. Note: the above is based on <compilation debug=”false”> being set in the web.config. If it is set to true, the compression, combination and minification for both the ClientDependency framework and ScriptManager is not enabled. Also, this is not based on having IIS 7’s dynamic/static compression turned on, these benchmarks are based on Umbraco performing ‘as is ‘ out of the box which will be the same for IIS 6. Though there’s only 3 tests listed above, these results will be consistent throughout all applications in the Umbraco back office in version 4.1. In 4.0.3, all ScriptResource calls generated by ScriptManager were not being compressed or minified. This was due to a browser compatibility flag that was set in the base page (this was probably very old code from pre v3!). Compared to 4.0.3, this is a HUGE difference with some serious performance benefits! There’s still a provider model for MVC but it uses a slightly different implementation from Web Forms. The same compositeFiles provider model is used but instead of the fileRegistration provider model that is used in Web Forms, a new mvc renderers provider model is used. A renderer provider is similar to the Web Forms fileRegistration providers but instead of registering the markup in the page using the page life cycle, a renderer provider is used to render out the html block necessary to embed in the page. All of the functionality that existed in Web Forms exists in MVC. You can make as many views that you want dependent on as many of the same or different client files that you want and the system will still sort by position and priority and remove all duplicate registrations. Rogue scripts & styles still get processed by the composite file provider in MVC. Currently however, if you place user or composite controls on your views that have Client Dependencies tagged with either the control or attribute method used in Web Forms, these will not be registered with the view and output with the renderer. ASP.Net Client Dependency Framework RC1 Released! With the community feedback, bug reports, patches, etc… I’ve managed to find time to upgrade this library to a release candidate status. We do use this framework in many production websites but it was great to hear from other in regards to specific bugs that were found relating to particular environments. These bugs have all been fixed up and this library is looking very stable. Better yet, I’ve put together a near complete documentation library on CodePlex here !! I still think the best way to learn about this project is to download the source code from CodePlex here and have a look at the demo web application included. Moving forward, the next phase for this library is to add MVC support and another file registration provider called PlaceholderProvider which will give you even more granular control over where dependencies can be rendered in your markup. MVC support should be fairly straight forward and we’ll include a demo project for this as well. Happy day! Any and all feedback, bug reports and patches are definitely appreciated! I’ve posted a new Beta release on CodePlex, you can get it here: http://clientdependency.codeplex.com/Release/ProjectReleases.aspx. On the releases tab includes a sample web site that has most of the functionality that you can do so please download it for a documentation reference. Forced providers! You can now force a dependency to use a particular provider. This can be useful if you want to ensure that a particular script or stylesheet is rendered on to the page differently. For example, you may want to ensure that a script is lazy loaded (using the lazy load provider) but the rest are rendered in the page header. Though this framework will be included in Umbraco 4.1, we’ll be leaving this functionality out of the Umbraco build as we realize that there are quite a few installs that operate behind a firewall that won’t have access to the CDN.